i.e., a hill having seven peaks of its zenith. The Annual Report ofthe Archaeological Survey of India, 1925, recorded that in Goalpara district there is a hill locally known as Surya Pahar which is believed to be associated with the Sun worship. The prevalence of Sun worshiping is supported by various discovered archaeological representations of Sun in this region. The KalikaPurana, a work in about 10th century A.D. composed in ancient Kamarupa mentions Sri Surya Mountain as the perpetual abode of the Sun God. The Text again cited, in Chitrasaila, the nine planets were worshipped. The Surya Mountain of KalikaPurana is evidently Surya Pahar, near Goalpara and Chitrasaila has been identified with Arvak hill near Guwahati. The Markandeya Purana speaks about the worship of Sun not only for attainment of welfare and desire but also for removal of disease. 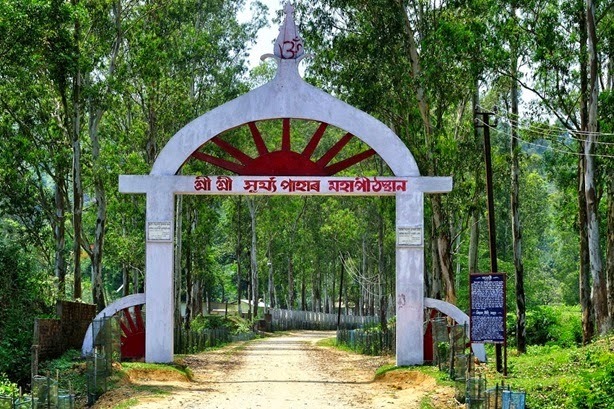 In 1993, the Archaeological Department, Govt of Assam carried out excavation in the famous heritage site of Goalpara, Sri Surya Pahar and many relics were discovered from this site. Among them, the PanchaRatna Basement of an ancient temple along with a ceiling stone slab Surya Chakra curved in circular form with image of twelve Aditya and in the central portion there is a figure of Ganesha. 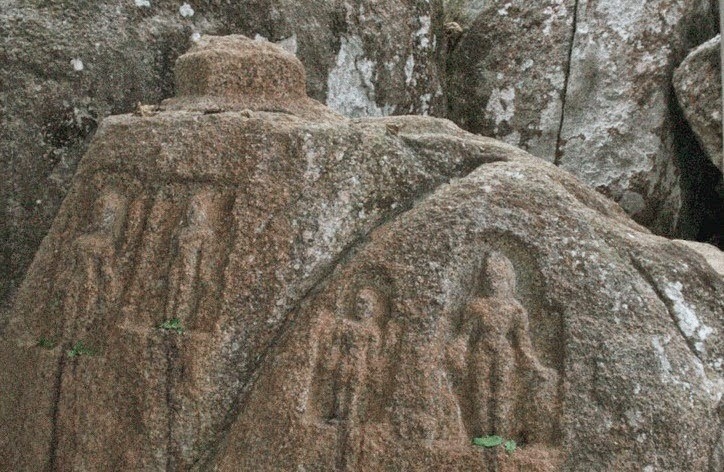 In the north western direction of Surya Chakra, at the foothills of Sri Surya Pahar, various figures found engraved. Here one twelve armed deity with seven hooded canopy over its head stands prominent. The deity wearing a necklace, Kundals, armlets, hiramukta and long garland stands on sampada on a lotus with a crude representative of a tree on either side. The attributes in its hands are not very clean. The arrangement of the left group of hands is identical arts that of right group. It is a syncretise icon, assimilating attributes of more than one god, its counter parts and prototypes are founds in different parts of Bengal like Ghiasabed (Murshidabad), Garal (Bardawan), Sonaranag (Dacca), Deulibira (Bankura) and Mukteswar. By the side of this image, there are series of rock-cut figures. During the excavation under Archaeological Department of Assam from 1993-98, a large number of Buddhist Stupas, Monasteries or Viharas are excavated from the eastern hill slope of Surya Pahar. According to Experts of ASI, all these belonging to 8th and 9th century A.D.
On the South-Western side of the Surya Chakra, there is a natural cavern. Inside the cave, two rock-cut images have been discovered. One has a bull marked on pedestal and the other an effigy of Chakra. The texts prescribe these two figures are to be identified as Rishabhanath (Adinath). The images seem to be belonging to the 9th century and indicate the existence of a few followers of Jainism in this region. Besides these, several rock-cut sculptures, images of Vishnu, Ganesha, Buddha, Sivalingas (It is believed that 99,999 Siva Lingas are there and it is said that Vyasdeva made these Lingas because he wanted to make it second Kashi. 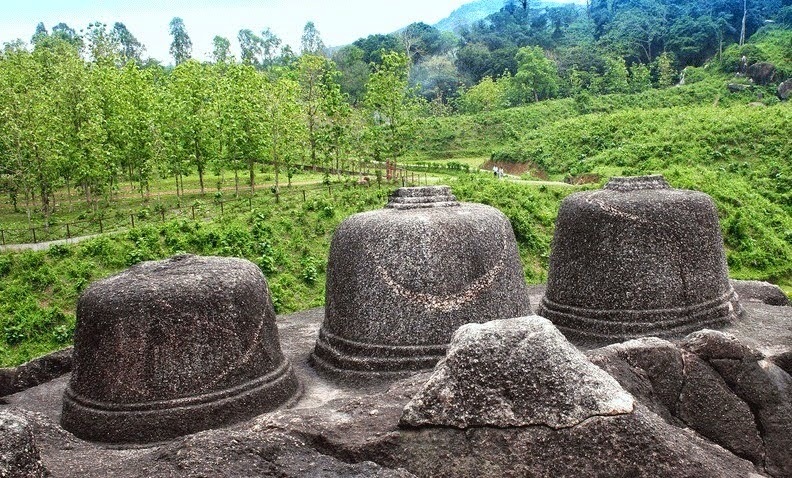 It is also believed that thirty three crore gods and goddesses of Hindu faith are curved out on the rocks in the hills here), many ancient objects, i.e., huge number of utensils have been discovered from this site and kept in a museum at Surya Pahar area. 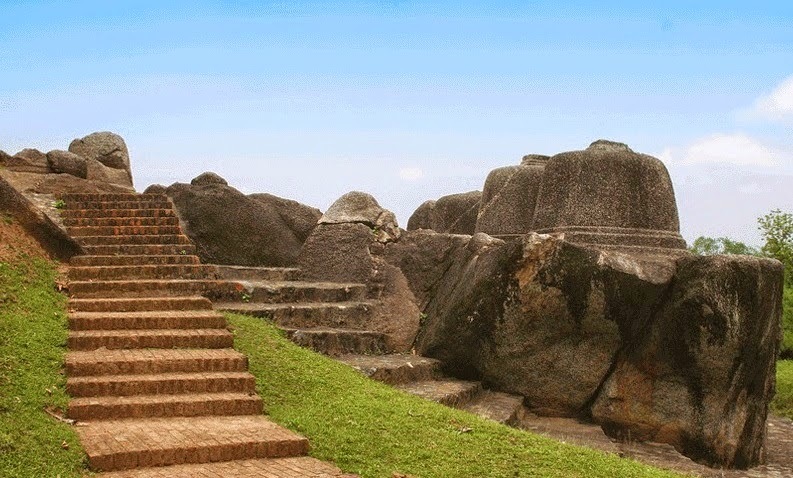 Sri Surya Pahar is one of the important historical sites of cultural heritage of western Assam in particular and India in general. Thousands of tourists and pilgrims visit this site every year, especially in the month of Magh (January/February). This hill is a stone house of innumerable ancient remains belonging to Hinduism, Buddhism and Jainism. Due to its similar affiliation with Hindu, Jaina and Buddhist remains, it could be termed as the Ellora of the North East India.